As we're pretty big fans of Google, it's no suprise we’ve talked about Google+ and how it squares up before, and now we're back there again! This month finally sees the release of Google+ for businesses, so now we’ll be taking a look at what Google+ has to offer you as a business, or brand owner. The Google+ strap line is ‘Real-life sharing, rethought for the web’ and refers to G+ as a social networking and identity service. Summarised it is a tool to help businesses communicate; ‘you share, they recommend, you both connect’ in short and it will make a difference to businesses that already use Google Products and that have embraced communicating and listening to audiences . 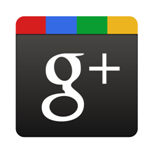 Google+ has a number of tools and features on offer. Google Circles allows you to organize friends and acquaintances according to real life social connections, great for customisable list building and communications. Extended Circles allows you to share content with those who are one degree removed from yourself. The Stream allows you to see posts in real time of particular Circles, and any comments made will be visible to all Circle members. Group and Video Hangouts allow you to hold video meetings, seminars or conferences with followers and fans without the need for additional software or websites. Google+ also integrates smoothly with mobile and has its own app for Android phones; there is also a messenger function, games and profile verification. Links can be added under the category of either recommended links, other profiles (web pages about yourself) or contributor to (sites you have written for), there is also, of course, the +1 Badge, which we’ve also talked about previously. It is worth noting that +1’s will be shown with your brand page and search ads. A +1’d page shows prominently in the search results, with a trusted face attached called ‘authorship on search results’; an endorsement by people recommending your product or service. Perhaps one of the most interesting features (exclusive to) Google+ is Ripples. Google+ Ripple is an interactive diagram that shows how a Google+ post spreads as it’s shared by users and you can look at this information for any public post on Google+. So why is this useful for a business? 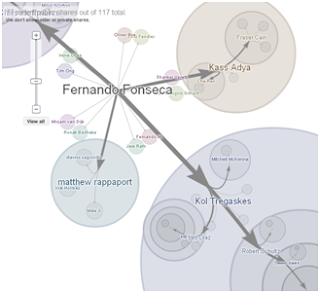 Well, you can see an overview of who the top sharers of your content are, how the posts spread, what languages the sharers use, as well as the timelines and a detailed view of sharing within different circles. Not only does this make it incredibly easy to measure the impact of any campaign or content, but because all Ripples are totally transparent, you can look at an end goal and, to some degree, engineer your own Ripples. For example if you see an influencer you want to get content too, by looking at who’s content they’ve shared themselves (and so on) you can work back through the Ripples to see what users you need to target content at, so that it might ultimately be shared by your influencer. Full integration with other Google owned products, such as YouTube, and Google cloud services, such as Picasa or Blogger. 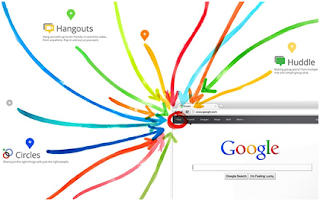 An attractive prospect to marketers; integration of Google+ searches within Google. Approximately 40m early adopter members, which represents just a fraction of the overall Google users, so a huge potential user base. Your Google+ page will rank higher then Facebook in Google searches for your brand name. Ultimately, tracking traffic and conversion rates from your Google+ page will be easier, although Google Analytics and G+ are not currently connected; it’s definitely in the pipeline. For Local Businesses, a corporate brand page can be set up, then different Google+ pages for each local business. Google+ is content driven and can be used to share highly focused content that will track well in niche searches, Google+ brand pages could be used as landing pages in their own right. Flashlight has already outlined strategic use of Google+ for clients. It is worth noting that ‘Google+ is not Facebook’. It is certainly more about doing business with likeminded people in your network; and as such, a business would benefit from outlining how a Google+ page will benefit them specifically, what type of content would naturally be of interest to their network and what tone of voice to use. Google Fresh, the latest ‘Google Update’ is all about trust and authority and it encourages businesses to follow the good practice ‘business conversation and content guidelines’ outlined by Google and in return, Google returns these businesses high in the search results. Google+, used appropriately, in conjunction with a good website, will improve a business’s chance of being found in a Google search. Google dominates the UK search engine market with a 90.59% share of the market. If you’re interested to learn more about Google services and networks of interaction, and how the above can benefit your business, why not get in contact with the Flashlight team and see how they can give your business or brand a helping hand. If you are reading this out of office hours, please use the contact Flashlight form and we will get back to you to discuss how Google+ can form part of your overall channel optimisation and campaign marketing strategy. Check out the Rocktime Social blog later this month for a quick overview on the ins and outs of Google+ for businesses, and what to be aware of.